Weeds and cover crops can compete with grapevines for water, nutrients, and sunlight. Competition for water is especially critical during vineyard establishment. The goal of weed management in the early years of vineyard establishment is to minimize weed competition with young vines in order to promote vine growth and early cropping. As a general rule, in New York we expect about one-half of a full crop in the third year of vineyard establishment, and a full crop by the fourth year. Lack of sufficient weed control is one of the major causes of reduced productivity and profitability in the early stages of vineyard establishment. Weed management must be considered prior to planting the vineyard. At a minimum, perennial weeds should be eliminated from the vineyard site in the year prior to planting. This can be accomplished using a broadcast application of the systemic herbicide glyphosate, usually prior to plowing. Cover crops can also be used to out-compete weeds and promote soil tilth; see site preparation section. Prior cropping history should be considered in the planting of a new vineyard. In pastures, hayfields, and meadows, perennial plants predominate and should be eliminated prior to planting the vineyard. In annual cropping systems, the use of residual herbicides that may affect early grapevine growth should be avoided. Many herbicide labels list a time period that should be met prior to replanting to another crop, as carryover restrictions can be one or more years. Annual weeds that proliferated and produced viable seed in previous years may result in very heavy weed pressure from a few weed species. If replanting grapes in an old vineyard or orchard site, the use of soil residual herbicides can be avoided by using only non-persistent, post-emergence herbicides in the year or two prior to replanting. Rather than replanting directly following removal of an old vineyard or orchard, several years of growing cover crops to build soil tilth and discourage replant problems are preferred. Eliminating perennial weed growth with the use of a systemic herbicide such as glyphosate and/or cover crops, followed by fall plowing, is a common method of land preparation for vineyard establishment. In erodible sites, a preferred method is establishing a cover crop to minimize soil loss during the winter months, then killing a strip of vegetation in the spring where the vine rows will be planted. If glyphosate is used to kill weeds or cover crops prior to planting, refer to product labels and insure a sufficient rate of herbicide is used to kill the target plants. Use of glyphosate will not result in any soil residual activity that could stunt vines (or weeds) following application. Hoeing and hand-weeding are extremely labor intensive and must be conducted several times during the growing season to control weeds. This is only practical in very small vineyard plantings. Mechanical weed removal. 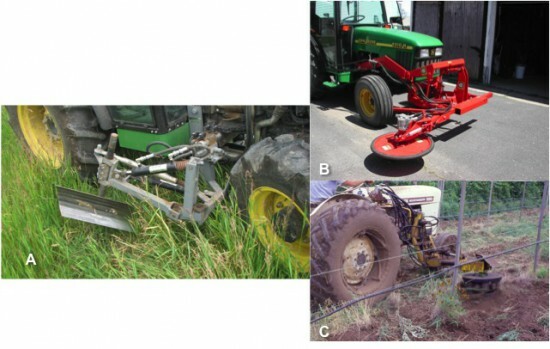 There is a wide assortment of mechanical implements that can be used for under-trellis weed control in vineyards (Figure 1). Mechanical hoes can be used to push up or pull away soil to smother small weeds, and rotary tine devices can be used to disrupt weed growth near the vines. These practices are relatively labor and fuel intensive. Mechanical weed control often results in a strip of weeds at the base of the vines. Mistakes, or "tractor blight" with mechanical implements can result in lost productivity and the need to replant vines. Some implements employ a trip mechanism to minimize the potential for damaging the vines. Under-row mowing has the potential for weed management in vigorous established vineyards, but this practice will likely result in excessive competition during vineyard establishment. Figure 1. Mechanical weed removal. A. Grape hoe. B. Under-the-row mower. C. Rotary hoe. Black plastic and landscape fabrics can provide excellent weed suppression, but are generally cost-prohibitive and can be damaged or displaced during various vineyard operations. Organic mulches - such as straw or hay - are generally not used in vineyards around the base of vines due to the potential for vine damage caused by rodents, and mulch or weed growth at the base of vines can harbor cutworms that feed on emerging shoots in the spring. Additional information about non-chemical methods of weed management in vineyards can be found in the New York State Integrated Pest Management Program's 2010 Production Guide for Organic Grapes or the Vine Balance workbook or newsletter. Chemical weed control. Chemical herbicides are often used in grape production, but options for use during vineyard establishment are limited. Herbicides are classified as either pre-emergence or post-emergence (Figure 2). Pre-emergence herbicides are applied to the soil where they interfere with weed seed germination and growth, whereas post-emergence herbicides are used to control existing weeds. Post-emergence herbicides are either contact herbicides that kill the top growth of weeds, or systemic herbicides that are translocated throughout susceptible plants and kill the entire plant. Many annual weeds are controlled by contact herbicides, but repeated applications are needed to control or suppress most perennial weeds. Susceptible annual and perennial weeds can be controlled with applications of systemic herbicides. 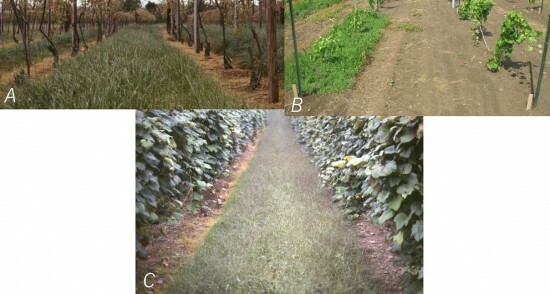 Herbicides registered for use during vineyard establishment (first, second, and third year vines) are discussed below. Row middle management systems (to manage weed growth and competition) for new vineyards include cultivation, herbicide, mulching, and annual or perennial cover crops. Selection of any of these strategies relies on site selection and soil properties. 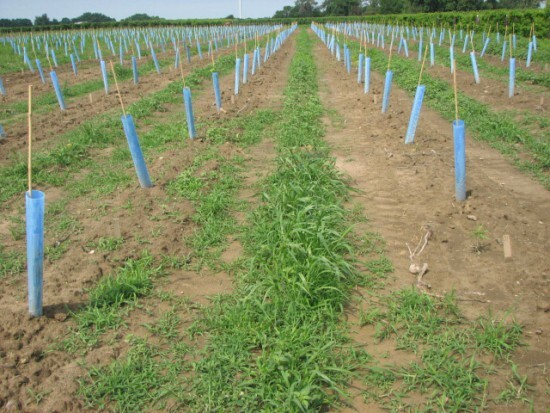 For example, in well-drained sites with high organic matter, a cover crop might be essential to manage vine vigor through water competition. Information on herbicide applications and sprayer technology in vineyard row middles can be found in the 2010 New York and Pennsylvania Pest Management Guidelines for Grapes. Figure 2. Chemical weed control options. A) Annual rye cover crop with herbicide strip under the trellis. B) No weed control, left, versus chemical weed control, right. C) Post-emergence weed control, left, versus pre-emergence weed control, right. Plastic grow tubes can be used during the first year of vineyard establishment (Figure 3). An advantage of this method is avoidance of herbicide contact which may be injurious to the vines. Another advantage is protection of young vines from feeding by animal pests, such as deer. Disadvantages include cost and the potential for an increase in insect feeding within the tube from insect pests such as Japanese Beetle, which can feed on grapevine leaves and cause damage resulting in reduced vine growth. Figure 3. Plastic grow tubes can protect vines from herbicide sprays during vineyard establishment. Again, information on herbicide applications and sprayer technology can be found in the 2010 New York and Pennsylvania Pest Management Guidelines for Grapes. Two types of herbicide boom applicators are available (Figure 4). 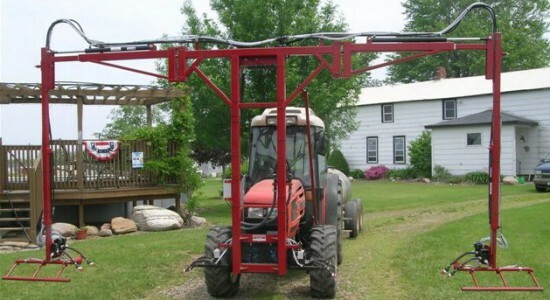 An over-the-row frame can be used to simultaneously spray both sides of the target row, or a boom can be fitted to the front of a tractor to spray one side of two adjacent rows. Another type of sprayer is the Controlled Droplet Applicator (CDA). CDA sprayers use a spinning disc under a plastic dome that shields the vines from contact with herbicide. For smaller applications, a backpack type sprayer may be used. Figure 4. Weed control equipment. Top left - Controlled Droplet Applicator (CDA) sprayer. Top right - over-the-row spray boom applicator. Bottom - two-row weed sprayer. Many herbicides registered for use in grapes have restrictions based on age of the vines. The restrictions represent liability concerns of the manufacturer. It is illegal to use any pesticide or herbicide in a manner inconsistent with its labeling. A complete list of herbicides registered for use in New York and Pennsylvania vineyards can be found in the 2010 New York and Pennsylvania Pest Management Guidelines for Grapes. The information contained here represents, in our experience, the most common herbicides and techniques used by growers for vineyard establishment. **Remember: When applying any pesticides or herbicides, always read the label... the label is the law. Herbicide options that can be used in the establishment years of a vineyard are limited, and many of them are limited in the spectrum of weeds they control. An "*" indicates the material is a restricted use pesticide and can only be purchased and used by Certified Pesticide Applicators. Please see the New York State Department of Conservation, the Pennsylvania Department of Environmental Protection, or your own state's department of environmental protection website for more information on becoming a certified applicator. Also, be sure to note that some chemicals are not registered for use in specific New York Counties, or New York State. ALWAYS CHECK THE LABEL. Surflan A.S.Ã‚Â® (oryzalin). Oryzalin is a relatively safe herbicide to use on newly planted vines. The only restriction is that the soil should be settled around newly planted vines prior to application. Contact with grapevine shoots and leaves is not prohibited, and current observations indicate that this is a safe use of the product. Some broadleaf weed species such as common ragweed are not controlled with oryzalin products. If ragweed pressure is anticipated, one method of controlling it is to plant the vineyard, allow the ragweed to germinate, control it with cultivation (using a fixed blade or rotary hoe), and then apply the herbicide over the top of actively growing vines. Obviously, one should avoid tank mixing with other herbicides that might damage contacted foliage should be avoided. ProwlÂ®, Pendimax 3.3 ECÂ® (pendimethalin). Pendimethalin is related chemically to oryzalin and controls a similar spectrum of weeds. Unlike oryzalin products, pendimethalin products need to be applied when the vines are dormant. DevrinolÂ®(napropamide). Napropamide is not chemically related to oryzalin or pendimethalin, but it controls a similar spectrum of weeds. The active ingredient is degraded by exposure to sunlight; applications should be made when sufficient precipitation for incorporation into the soil is expected soon after application. *GalleryÂ®(isoxaben). Isoxaben selectively controls annual broadleaf weeds with no grass control anticipated. It is a potential tank-mix partner with oryzalin, pendimethalin, or napropamide to provide more broad-spectrum weed control. The soil needs to be settled to avoid vine injury. Do not apply within one year of harvesting fruit. *GalleryÂ® is not registered in New York State. *SnapshotÂ®(isoxaben plus trifluralin). SnapshotÂ® is a pre-mix that provides broad spectrum annual weed control. Do not apply within one year of harvesting fruit. *SnapshotÂ® is not registered in New York State. MatrixÂ® (rimsulfuron). Rimsulfuron provides relatively short-term control (less than 60 days, in our experience) of annual grasses and broadleaf weeds. It might be an option as a tank-mix partner with oryzalin, pendimethalin, or napropamide to provide broad-spectrum weed control. ChateauÂ® (flumioxazin). Flumioxazin is a broad-spectrum herbicide that controls most annual grass and broadleaf weed species. It is unrelated to other herbicides used in grapes and is a valuable resistance management tool for use in vineyards when used in a rotational program with other herbicides. There are some restrictions that apply to flumioxazin use in vineyards that are less than 3 years old. Damage to emerging buds and shoots can occur from contact with spray, mist, or splashing from the soil surface. Newly planted vines must be protected from herbicide contact by non-porous wraps, grow tubes, or waxed containers. Additionally, own-rooted varieties such as 'Concord' are susceptible to vine stunting if heavy rainfall occurs soon after application, even when protected with grow tubes. The label states that new plantings of own-rooted varieties should be planted so that all roots are a minimum of 8 inches below the soil surface to be treated. This may require hilling around newly planted vines so that the settled depth of the hill will be 4 to 5 inches above the vineyard floor. Additional restrictions apply to application rate in sandy soils. Consult the label for more information. SolicamÂ® (norflurazon). Used at the appropriate rate which is based on soil type (consult the label), norflurazon can provide season-long control of annual grasses and certain broadleaf weeds. A tank mix with an herbicide that provides broad-spectrum control of annual broadleaf weeds may be needed for broad-spectrum weed control. Several inches of rainfall are needed to move the herbicide into the soil, so fall or early spring applications are suggested. Vines must be established for two years prior to norflurazon application. SolicamÂ® - norflurazon - is not registered for use in Nassau and Suffolk counties in New York. GoalÂ®, GoalTenderÂ® (oxyfluorfen). Oxyfluorfen primarily controls annual broadleaf weeds; a tank mix with an herbicide that controls annual grasses is generally suggested. Oxyfluorfen must be applied prior to bud swell, as later applications may result in significant vine injury by damaging emerging buds. Do not apply to vines less than 3 years old unless vines are on a trellis at least 3 feet above the soil surface. RoundupÂ®, TouchdownÂ®, and many generic products (glyphosate). Glyphosate is a systemic herbicide that controls most annual and perennial weeds. Consult the label for the best rate and timing depending on the weed species present. Vine damage can result from application to green grape tissue. Applications should only be made when vines are dormant, when shielded equipment is used, or when vines are protected with non-permeable grow tubes. PoastÂ® (sethoxydim), FusiladeÂ® (fluazifop-P-butyl), SelectÂ® (clethodim). These are related herbicides that provide systemic control or suppression of annual and perennial grasses only. Applications must be made to young, actively growing grasses (consult the label for recommended rates and growth stages). Sethoxydim can be used on vines of any age, but not within 50 days of harvest, and it can be used for over-the-top applications. Fluazifop and clethodim can only be used on non-bearing vines while avoiding contact with grapevine foliage. Gramoxone InteonÂ® (paraquat). Paraquat is a restricted use pesticide that provides burn down of contacted foliage. Repeat applications are needed to control or suppress perennial weeds. It can be used for chemical suckering where desired. Avoid contact of spray or mist with young vines. RelyÂ®* (glufosinate). Glufosinate is primarily a contact herbicide that provides burn down of contacted foliage. Repeat applications are needed to control or suppress perennial weeds and it can be used for chemical suckering where desired. Avoid contact with foliage and green bark on young vines. *RelyÂ® is not registered for use in Nassau and Suffolk counties in New York. Senseman, Scott A., ed. 2007. Herbicide Handbook, Ninth Edition. Weed Science Society of America. Uva, Richard H., Neal, Joseph C., and DiTomaso, Joseph M. 1997. Weeds of the Northeast. Cornell University Press. Weigle, Timothy H., and Muza, Andrew J. 2010 New York and Pennsylvania Pest Management Guidelines for Grapes. Zabadal, Thomas J., and Andresen, Jeffrey A. Vineyard Establishment I - Preplant Decisions. Michigan University Extension. Zabadal, Thomas J., and Andresen, Jeffrey A. Vineyard Establishment II - Planting and Early Care of Vineyards. Michigan University Extension.